Soulsters, this is far from being new news, but I had to revel in it nonetheless – Tamia is back! Now, Canada is home to many a soul sister – Deborah Cox, Melanie Fiona, and many, many more. But one of my all-time favourite singers from Canuckville is Mrs. Tamia Hill aka Tamia. Ever since Quincy Jones introduced us to the powerhouse singer, I have been head over heels and absolutely biased when it comes to her work. Why biased you may ask? Well, Tamia was one of my very first artist interviews for a magazine I worked for back in the day and it remains one of my favourite interviews to date. Tamia’s discography has given us multiple gems like “Imagination”, “You Put A Move On My Heart”, “Spend My Life With You” with Eric Benet, “Officially Missing You”, “Still” and I can go on and on. Time and time again, I was never disappointed with Tamia’s releases and those powerfully sensual and commanding vocals. Just a couple of months ago, I was listening to an older Tamia track asking where or where could one of my favourite soul sistrens be. Imagine my surprise and delight when I heard about her new upcoming release LoveLife that will be released in June on her newly signed label Def Jam. Here we are now anticipating a new album, and we also have a new single – “Sandwich and a Soda”. 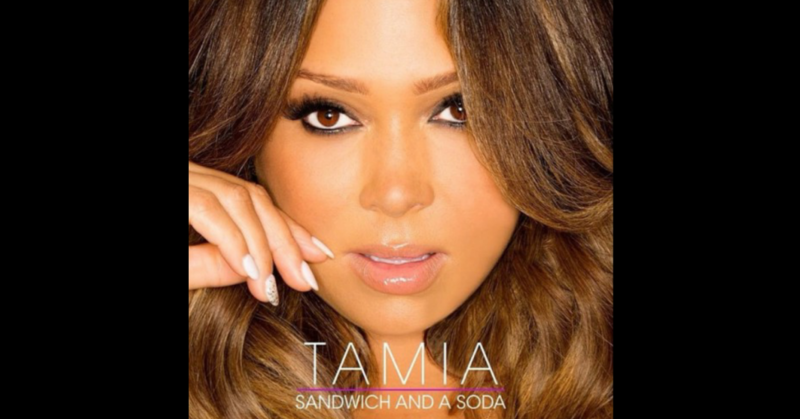 Tamia is delivering her sultry vibes over a slick beat. I like it – I’m not crazy over it, but I can see it definitely growing on me. It’s fun, energetic and upbeat. A dance floor track. But it’s only the first single, and I of course ant more (no pun intended). One thing that I have learned about Tamia is that one song does not set the entire tone of her album. With that being said, I am really curious to hear what she has in store for the other tracks that will be laid on LoveLife. I guess we will just have to wait and see. Until then, press play on “Sandwich and a Soda”.